I was honored to be asked to give the keynote presentation at the “Emerging Pieces of the Education Puzzle” conference on the Campus Skellefteå located in north east Sweden. Unfortunately I had previous engagements before and after in other parts of the world and was not able to be there physically, but we did the next best thing with a live video and audio for 90 minutes. There were several hundred educators, PhD and graduate students in attendance and we had a great discussion about the effects of so called “Web 2.0” and other changes on the future of education and learning. The slides “Wassup with Web 2.0? a VERY BIG Picture is Emerging from LOTS of Little Pieces” are available from SlideShare.net and accessible below. NOTE! see the note at the end of this posting about an exciting new feature of SlideShare! which now let's you download all the slides themselves as well as viewing them here. "Each pattern describes a problem that occurs over and over again in our environment, and then describes the core of the solution to that problem, in such a way that you can use this solution a million times over, without ever doing it the same way twice." Those of you who are familiar with my concepts and models will see how well this aligns with my visions of mass personalization and uniqueness. I put together a list of “Continuing characteristics of the continuum” (slides 16 & 17) referring to my comments on the importance of recognizing Web 2.0 as being a phase or stage of a continuum and the need to see the continuing trends within this phase that will continue into the next. Feedback loops which are one the fundamental components of enabling mass customization and personalization. Current examples include the “thumbs up/thumbs down” type of feedback seen in things like StumbleUpon and the rating of your music preferences in the likes of Pandora. These feedback loops need to become a universal and ubiquitous presence in literally any and all “consumables” (reading, listening, watching, etc.) and also branch out to include gathering inferred feedback and the “natural feedback” we are continuously providing based on what we do, decisions we make, etc. Harnessing the collective intelligence of the groups and communities around any topic, industry, issue. The notion popularized by the research of James Surowiecki and his 2004 book which coined the term "Wisdom of the Crowds". Dan Farber had some good observations about this in his recent post and video “Web 2.0 for the Enterprise: Wisdom of the Employees” including a video of the panel interview he facilitated at the Web 2.0 Expo in San Francisco. I’ll leave you to look through the slides for more of what I covered and do let me know if you would like to see more details on any of the characteristics and points I make in the slides. Finally, two of the most recent and best examples of the characteristics of Web 2.0 and beyond are Joomla! and Zude. Rather than try to explain Zude check out this interview and demo. This is NOT an endorsement of either of these applications but rather to provide you with what I believe to be GREAT examples of the tipping point that is developing around my theme of “MC2: Mass Customization x Mass Contribution”. Have some “serious fun” spending some time to “play” with both of these and I’m convinced you will start to see how these enable and encourage almost anyone from your grandmother to your 4 year old nephew to be able to be both a content producer and consumer and do it all THEIR way. I am particularly intrigued by the combination of both these types of “applications” with something like Joomla!! providing the functionality for content management however formal or informal, and something like Zude providing the functionality for assembling just the right stuff, just the right way, just for me. Keep your eye on these types of functionality and I’ll be reporting more as I do so as well. I ended my keynote to the group in Skellefteå Sweden with a brief overview of my concept of the Snowflake Effect and the coming age of mass personalization and uniqueness. Based on just what I was able to cover under this banner of Web 2.0 it seems to me that the forecast for the future is filled with everything from snowflakes to snow storms and outright blizzards. No need to dress warmly though, just starts to similarly prepare to live, learn, work and prosper as the unique snowflake you are and with all the other snowflakes (and a few flakes) surrounding you! ** SlideShare now let's you download the actual slides! BTW and as a great example of Web 2.0, SlideShare has just announced a new feature I and most others have been asking and waiting for, which is the ability to not only see the slides but to also download them as either PPT slides or PDF. Providing direct access to the individual slides themselves is of particular important to me as I put all my content into the Creative Commons and the whole value proposition is for the share and reuse of my content and so that I too can benefit from the changes and improvements that others make to my content. All my slides will be posted with this feature from now on. 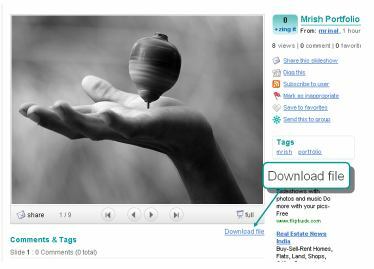 Anybody can download the file- whether a SlideShare account owner or otherwise. Go to the slideview page and look for the ‘Download file’ link at the bottom right corner of the slideshare flash player. Screenshot above.